From the headlines today a story concerning the issues at Penn State concerning the firing of their legendary coach, Joe Paterno. What caught my eye is the headline, “A Failure of Leadership”. As a blogger on leadership, I need to review and add my thoughts. The story tells us (read here) that the Penn State Trustees fired Coach Paterno because he did not do enough as a leader. “We determined that his decision to do his minimum legal duty and not to do more to follow-up constituted a failure of leadership by Coach Paterno,” the trustees wrote. I am not here to judge Coach Paterno. As a fan of college Football I grew up with the Coach as a fixture of the College sports landscape. Yet from my read of the situation there was a failure of leadership. What a strong, emotional case to point to the basic definition of Leadership as a process of Influence. 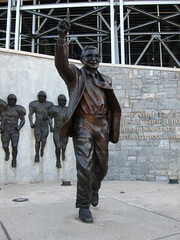 No one anywhere doubts the sheer level of influence Coach Paterno had with the University. With such influence he could have done more to improve the situation years ago when it needed to get done. A true leader takes decisive action when needed. A true leader finds a way to improve even dire situations. A true leader watches out for all within his or her sphere of influence. Leadership is difficult. It is a process and takes time to build relationships and credibility. One of the lessons from Happy Valley is how quickly leadership can crumble when one does not hold to the basic tenets of leadership. While this was a terrible story there is a lot to learn about human nature and leadership. Joe Paterno was not the only one who failed in his duties at the University. Many people apparently ignored what was happening. Why? Friendship? Loyalty? If the most powerful person in an organization can’t stand up and do what’s right, what are the chances that someone else will? Thanks for your comment. Everyone is waiting for someone else to act. Someone needed to stand up. A lesson for us all. Testing to see if I can respond to your posts….hope it works! Thanks Anonymous – yep, I changed my settings to allow for anonymous comments. I want to encourage everyone to comment – maybe folks closer to me at work. With the anonymous setup, I do not know who you are unless you want to tell me.